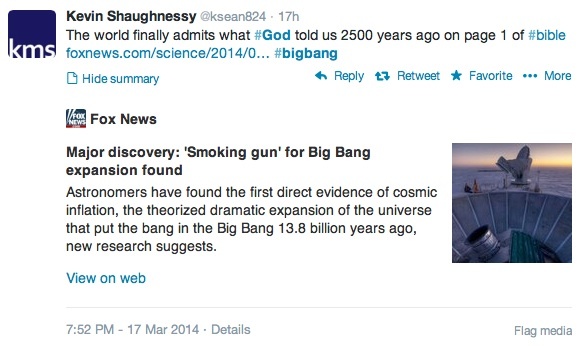 I was delighted by the news yesterday that the “smoking gun” in evidence for the Big Bang has been observed by cosmologists. After work I read through several news articles reporting the findings. Many of these articles allowed user comments, so I wandered down to the bottom of the page and began reading through many of them. What I observed was, needless to say, quite frustrating. It appears that some religious people, who find it more and more difficult to reconcile their beliefs with breakthroughs in cosmology (or any other field), are co-opting science to “prove” their ideas about god. I’ve provided many examples at the bottom of this post. What frustrated me about their comments is that it shows evidence to the idea that many religious people will change their minds about anything except their religion. I would even go so far as to posit that they would not change their minds about religion if we built a time machine and proved them 100% wrong. But furthermore, these findings do not in any way validate the Judeo-Christian religions. If anything, these findings cast more doubt over the book of Genesis. As I’ve mentioned before, Genesis is very specific about the universe: The earth is at its center. It is surrounded by a physical dome-shaped apparatus with holes in it (the stars) through which heavenly water falls to the earth as rain. Above that physical dome sits god and heaven. We have already proved this part of the bible wrong (hundreds of years ago). The Big Bang Theory provides us with an observable and testable methodology for determining how and when the universe actually began. This theory guts the creation story in the bible. Finding the “smoking gun” to support this theory essentially completely annihilates the hypotheses claimed in the book of Genesis. 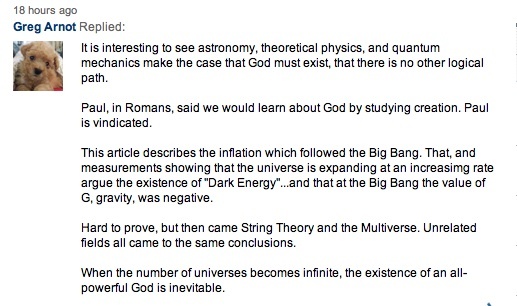 It does not support obviously useless biblical hypotheses, despite what the following Internet users believe. 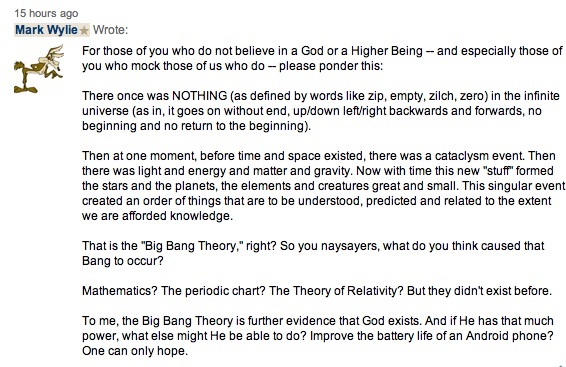 This entry was posted in Atheism and tagged Atheism, Big Bang, Big Bang Theory, Christianity, Christians, God, Judaism, Religion, the bible, the Big Bang. Bookmark the permalink.